Working in the restaurant industry with Salmon as a main dish, the question of “Is your Salmon farmed or wild?” Comes up often. I am pleased that my customers are conscious about their food consumption habits. Although, they are not always equally happy when I answer with “Organically farmed”. Instead, learning the Halibut is a fresh caught fish, tend to side with this option. But which is more environmentally sustainable? The problem people have with farmed fish is the close containment of the species and the food, supplements and hormones farmed fish are fed. Consumers then turn to wild caught options in grocery stores and restaurants, which has a whole list of issues of its own. Wild fish stocks are mainly caught around the world in coastal regions, being 90% of global fish catch. Long line fishing is the most common for commercial use. It contains lines with baited hooks, hauled in with an abundance of bycatch. Bycatch are the non target organisms in which are unintentionally captured and killed in the process. Bottom trawling is the most destructive and is a common practice used by coastal fisheries. Trawling drags giant nets on the ocean floor, causing mass destruction and clearing away large quantities of coral and fish. Not only is this harmful to the ocean itself, but the environmental impact through delivery and export is incredibly high. The average piece of wild fish travels over 8000 km before it reaches your plate. Some fishing practices in Canada and the United States include wild fish sent to China to be deboned and packaged, then refrozen and sent back to North America. Because of these practices, the worlds fish stocks are declining at a rapid rate. According to the UN food and agricultural organization (FAO), 70% of fish populations are under threat today. This has led to the prediction that by 2050, there will be no fish left in the ocean. Whether this number is set in stone, fluctuating, or wrong by a couple of years; the evidence is there, and it is terrifying. To the skeptics of this phenomenon, I use Canadian Cod as an example. Canadian Cod reached a population peak in 1968, and the abundance of this fish was overwhelming. In this 370 km international boundary, European and North American countries fought to catch and sell this fish as quickly as possible. In 30 years, there was a 97% decline in stock, resulting in Cod fisheries being closed in 2003. To this day, Canadian Cod is still a highly endangered fish and have not been close to recovering their population. As a result of an increased consumption of fish, yet declining fish stalks, fish farms began to rise in popularity. The beginning of fish farming, especially Salmon, was under researched and posed a variety of issues. Site locations were based on convenience. They were located outside of large cities and in crucial bodies of water. Fish were packed together, creating new diseases, spreading them to the (already depleting) population of wild fish. Nobody cared how much protein they were using to make protein. Environmental NGO’s began criticizing these farm stalks, sparking a demand for wild fish. As a healthy medium, organic fish farms are now being built, in Peru, Norway, Alaska and parts of Canada. Organic fish farms seem to be an innovative and environmentally sustainable way of consuming fish. No chemicals or antibiotics are used, and the fish are kept in a lower density in the pens. Some pens are kept out of the water, as to not disrupt the natural water systems. Although, in order to feed these organic organisms, they use wild fish, some of which may be endangered, or environmentally unsustainable. 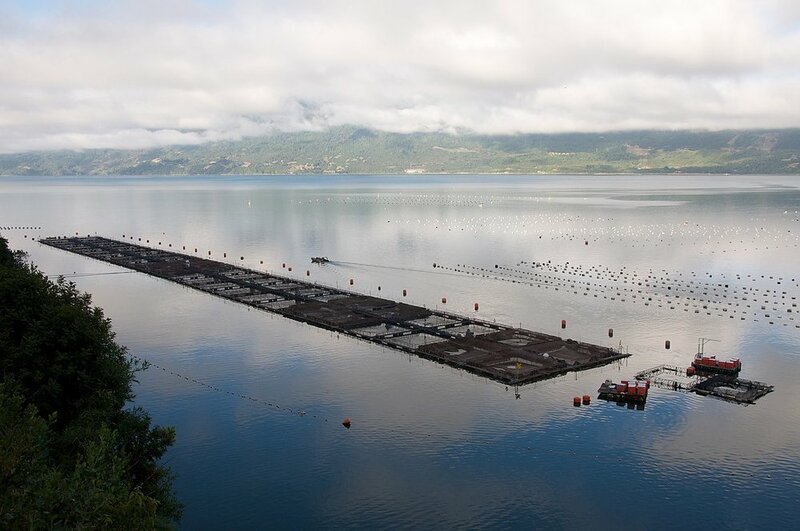 Unlike organic farms for above ground mammals, “organic” fish farms have very little regulations and almost no research has been conducted on the issue. Like most environmental issues, there is no simple solution to eating farmed versus fresh fish. What many experts give as a resolution; reduce your fish consumption. Possibly skip that second trip this week to all-you-can-eat sushi in order to reduce the demand on sea life. When eating fish, traceability of your product is key to understanding its environmental impact as well as its influence on your health. Being conscious about which populations are abundant and ones that are suffering is also very important. Atlantic Halibut, as previously mentioned, is classified as endangered, and are normally caught with bottom trawl fisheries. The Halibut population is in steady decline and is not expected to rise any time soon. Caviar –now not only reserved for the rich and famous, are the eggs of ancient beluga sturgeon. The fish is becoming heavily pressured and have also suffered from 90 percent of habitat destruction. The Winter Skate, most likely not on your radar. Although, it is used as fishmeal and lobster bait and is not on the critically endangered rate from the steep incline in lobster and fish consumption. Everyone’s beloved Atlantic Salmon, which have dropped to critically low levels since 1990, resulting in the rise of farmed salmon. My wish is for people to begin to savour the taste of Tuna, understand the luxury of Lobster as well as learn to appreciate the importance of fish to our aquatic ecosystems. Respect of the oceans’ capacity to feed our growing population is the only way to ensure a healthy and abundant ocean.